As the largest city in Australia, Sydney is the perfect place to visit on holiday deals. It is home to some of the most iconic spots in the country, including the Opera House, the Sydney Harbour Bridge, and Bondi Beach. The city offers the best of both worlds with a fast-paced city centre as well as laid-back coastal neighbourhoods. Throughout Sydney, you’ll find incredible shopping, restaurants, accommodation, nightlife, museums, and everything else you could look for in a cheap city getaway. Sydney can be an expensive city to visit, so make the most of your holiday budget with Webjet’s Sydney holiday packages and travel deals. These cheap Sydney packages bundle together your flight and hotel or accommodation costs, saving you several hundred dollars on your trip. Not only do Sydney holiday packages save you money; they are also convenient. Webjet will take care of the logistics for you, so you can focus on planning all of the experiences you want to have in Sydney. Sydney holiday packages are a great way for families or small groups who are visiting Sydney to save money. Start planning your Sydney adventure with Webjet’s Sydney accommodation and flight packages and travel deals. Sydney Airport (SYD) is the busiest airport in Australia, receiving thousands of flights each day from locations around the world. It is located 7 kilometres (4.3 miles) south of the CBD and offers several options to reach the city centre. While travelling domestically, the airlines offering the most flights into Sydney are Qantas, Virgin Australia, Jetstar, and Tigerair. Flights are available into Sydney Airport from airports all across Australia. If you are travelling from one of the country’s major cities, you’ll have plenty of options on your flights to Sydney. Direct flights are available regularly from Melbourne, Brisbane, Perth, Adelaide, Hobart, the Gold Coast, and Cairns. A variety of regional airports also offer direct flights into Sydney. Some examples are Albury, Ayers Rock, the Sunshine Coast, Coffs Harbour, and Launceston. Flights can range between 45 minutes and 4 and a half hours, depending on how far you are flying from. No matter where you are travelling from in Australia, you’ll have no trouble finding cheap flights to Sydney. Sydney offers a wide variety of accommodation options, ranging from cheap hostels to serviced apartments to five-star hotels. Booking your hotel as part of Sydney accommodation and flight packages can help you save several hundred dollars. Located minutes from Central Station, this hotel is in an ideal location for exploring the city. It has a modern, sleek style that still feels homely. Rooms are available in four sizes and start at $263 AUD per night. Many of the rooms offer nice views over the Sydney CBD. There is a restaurant in the hotel as well as complimentary WiFi and an airport shuttle available for a small fee. Capitol Square Hotel is part of the Rydges chain. The hotel is perfectly located just a short walk from Darling Harbour, Central Station, and Chinatown. It is a great option for budget travellers who are hoping to stay in the centre of all the action. There are 94 rooms available in several different sizes. While the hotel is located in an old building with lots of character, the rooms have a contemporary and comfortable design. This hotel is located within the inner suburb of Potts Point in a lovely Victorian building. Inside, the rooms are just as stylish. The hotel has an outdoor courtyard where you can spend some time after a day of exploring Sydney. Surrounding the hotel, the Potts Point neighbourhood will keep you busy. The neighbourhood has lots of trendy shops and cafes. It is also a quick walk to Kings Cross, which is one of the most popular nightlife areas in Sydney. Central Sydney is based around the harbour. Surrounding Sydney Harbour, you’ll find some of the city’s top attractions. The Opera House and the Sydney Harbour Bridge are the most famous places to visit. For the ultimate Opera House experience, you can attend a show there. 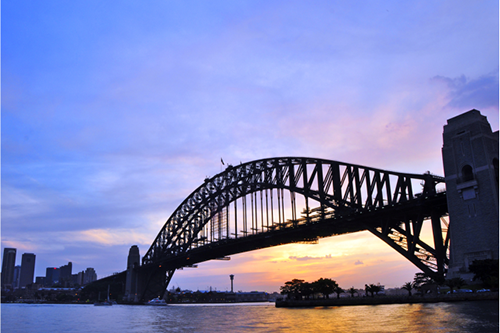 The Sydney Harbour Bridge offers great views of the city as you walk across it. Between the two icons, you’ll find the Rocks neighbourhood, which is the oldest neighbourhood in Sydney. There are endless beautiful places to see around Sydney Harbour. Sydney has several scenic walks along its coastline. The most famous is the walk from Bondi Beach to Coogee Beach. The walk takes a couple of hours to complete, but is not difficult. Along the way, you’ll find plenty of beaches and cafes where you can take a break. During the walk, the views of the ocean are breathtaking. You’ll also get to see several Sydney icons, including Bronte Beach and the Bondi Icebergs pool. The Botanic Gardens in Sydney are the perfect place to go to experience nature in the heart of the city. They have been in Sydney for close to 200 years. While visiting the Botanic Gardens, you’ll be able to see a vast array of plants that are native to the Sydney area. The gardens are located beside the harbour, offering some beautiful views. For the best view of the harbour, head to Mrs. Macquaries Point, which looks out over the Opera House and Sydney Harbour Bridge. The view is always lovely, but especially so at sunset.